Set Your calendars for May 12th. 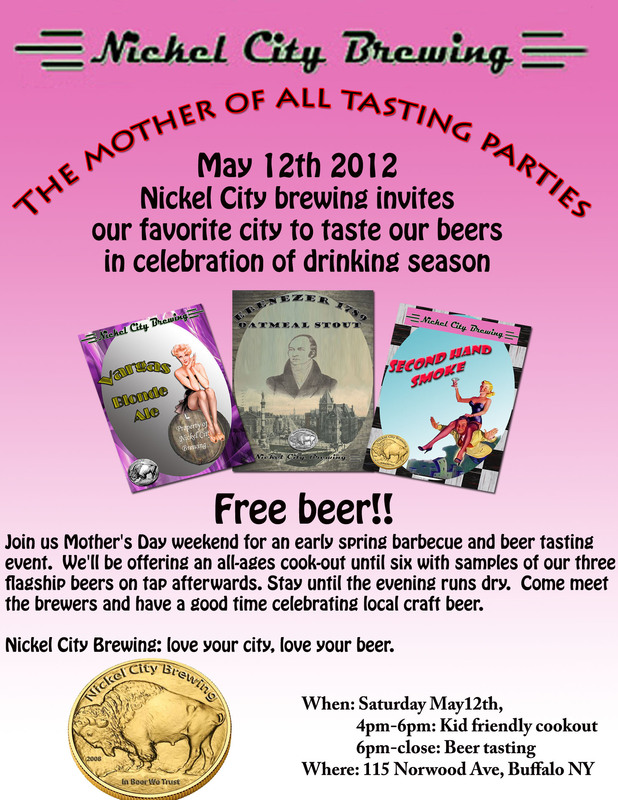 Nickel City Brewing is pleased to host our first tasting party since the hop harvest back in September. Those who were there for the last one know what you have in store. If you missed that one, this will be a great chance to come out the day before Mother’s day, meet the brewers, swap some tales and drink some beer. It’ll be a kid friendly environment between 4 and 6, so bring the family. Afterwards, us adults can enjoy some delicious fermented beverages late into the night. Can’t wait to see everyone there! For more details, go here! I’ll be sure to arrive early, and leave by 6. That way, the adults can carouse and imbibe to their hearts’ content.